This perceptive and engaging documentary examines one of the largest and most extraordinary popular celebrations in the world, the week-long Carnaval that brings more than two million people to the streets of Salvador, the capital of Bahia, in northeastern Brazil. 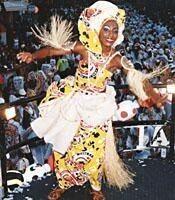 Carnaval is the most expressive showcase of the unique cultural richness of Bahia, where African culture has survived, prospered, and evolved, mixing with other Brazilian influences to create forms found nowhere else in the world. The film captures this unique cultural energy through extraordinary footage of musical performances, dances, religious manifestations, and street celebrations. At the same time, Carnaval reflects the racial and social tensions of Brazil’s heterogeneous society. At first glance there appear to be two million people chaotically mixed on the streets, but a more detailed look reveals how patterns of segregation driven by racial, social and economic differences continue in Carnaval. “Festive Land” explores the rich fabric of Bahian Carnaval from the points of view of four people of different social classes and backgrounds. Marcia is a young black percussionist trying to make a living as a musician. She sees Carnaval as an opportunity to pursue her dream. Ignez and Paulo come from upper-middle-class backgrounds and share a keen enthusiasm for the festival, but they seek out very different aspects of the celebration. Marcos views Carnaval as a way to remain connected to his African roots. Commentary is also provided by noted Brazilian artists, leaders, and scholars. Grammy winner Gilberto Gil gives a personal account of his participation in the quasi-religious afoxe group, Filhos de Gandhi. Daniela Mercury, one of the biggest pop stars in Brazil, discusses the varied influences shaping contemporary Bahian Carnaval music. Antonio Carlos dos Santos, founder of the group Ile Aiye, explains the significance of afro-centric Carnaval groups called “blocos afros,” and describes how racism is reflected in the social dynamics of the celebration. “Festive Land” will stimulate reflection and discussion in any course studying the African diaspora, cultural anthropology, Latin American studies, comparative religion, or ethnomusicology. It was produced by Carolina Moraes-Liu. "Refreshingly, this film explodes the long-running myth that Carnaval subverts the racial and class hierarchies that trouble Bahia and Brazil during the rest of the year. The film is not only beautifully picturesque and musical, but also sociologically smart." — James Matory, Prof. of Anthropology and Afro-American Studies, Harvard Univ. "This engaging film can be used effectively in anthropology courses dealing with Latin America, religion, performance, and gender and sexuality. It also is appropriate for introductory cultural anthropology. The film raises interesting issues of cultural diversity, gender, race, and class, as it conveys the spirit of play, pleasure, and energy that permeates Carnaval in Bahia." — Prof. Kathleen Zaretsky, Dept. of Anthropology, San Jose State Univ. For additional information, please visit www.aerial-productions.com.